Spacious 5000 sqft, move-in ready ranch home with completed landscaping, patio, firepit, window coverings, finished basement, etc nestled in a quiet, gated community. Main floor features include a Vaulted Great Room adjacent Kitchen with sliding doors to covered patio, KitchenAid Stainless Refrigerator, Double Oven, Gas Range, Dishwasher, Quartz countertops, Walk-in Pantry, Butler's Pantry, Master Suite with 5 piece bath, jetted tub for two, walk-in shower with bench, spacious walk-in closet, Guest Bedroom with 3 / 4 bath, Study with plantation shutters, and 8' tall doors. Lower level features a Family room Wet Bar with refrigerator and dishwasher, Media Room with built-in speakers, and 2 additional Bedrooms. Covered patio is perfect for enjoying Colorado year round, protected from sun, rain, or snow. Located on a quiet cul de sac. 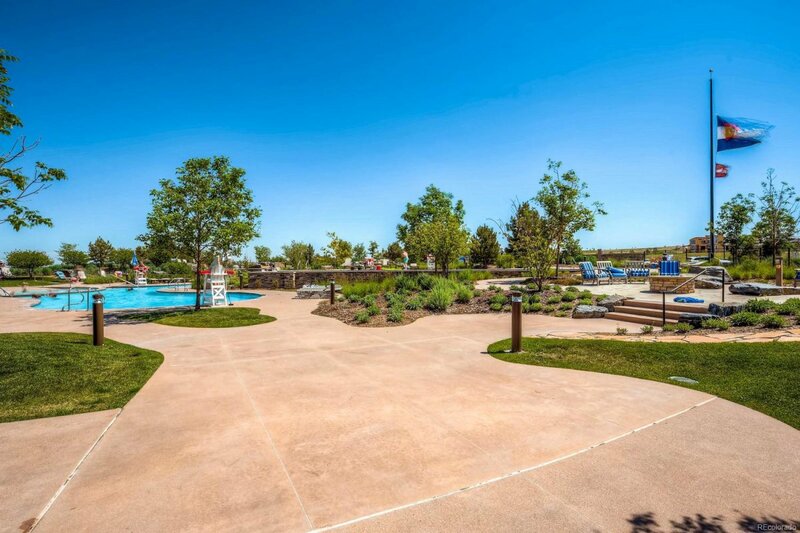 BackCountry amenities are second to none, with miles of trails, fitness center, pool and more.